Snacks are fun and nice because it’s what saves us from being hungry in between meals. Snacks can range from being healthy to unhealthy and that’s okay if sometimes you prefer the latter. But here in Radiant Peach, we want to optimize our meals into something that’s consistently healthy without sacrificing the taste. Below are a compilation of recipes that only take a maximum of 60 minutes to prepare but are packed with health benefits and are guaranteed to keep you full until your next meal. 1/4 cup store-bought za’atar spice blend. Place popped popcorn in a large mixing bowl and drizzle olive all over, tossing to coat evenly. Add za’atar, tossing to coat evenly. Season with salt and serve. Popcorn can be stored at room temperature in a zipper-lock bag overnight. Preheat oven to 425°F (220°C). Place sweet potato in an oven-safe vessel (such as a cast iron pan or a small baking dish) and roast until a knife or skewer inserted into its center meets no resistance, about 40 minutes. Remove from oven and allow to cool. Roasted sweet potato can be wrapped and stored in the refrigerator for several days before you continue with the recipe. Peel and discard sweet potato skin and mash flesh with a fork in a medium bowl. Add cilantro, pickled jalapeños, and scallions (see note). Stir and fold to combine. Season to taste with salt. Spread about 1/2 cup of the mixture evenly over half of 1 tortilla, leaving a 1/2-inch border. Fold tortilla over and seal edges by pressing down firmly. Repeat with remaining filling and as many tortillas as needed (about 4 to 6, depending on the exact size of the sweet potato). Heat 2 tablespoons (30ml) oil in a large skillet or on a griddle over medium heat until shimmering. Carefully add 2 folded tortillas and cook, swirling and moving tortillas around, until golden brown and puffy on first side, about 2 minutes. 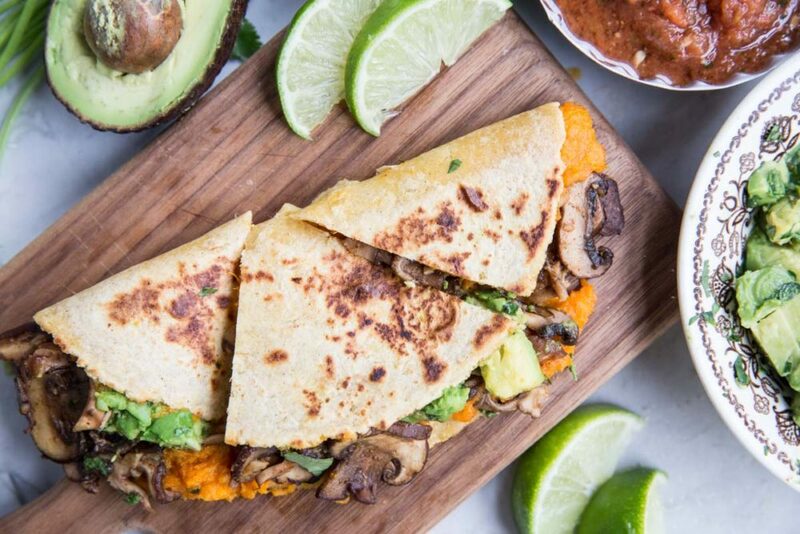 Using a flexible metal spatula, flip quesadillas, season with salt, and continue cooking until golden brown and puffy on second side, about 2 minutes longer. Transfer quesadillas to a paper towel to drain and repeat step 4 to cook remaining quesadillas. Serve immediately. In a bowl, cover pecans with at least 1-inch water and let soak for 1 hour. In a large saucepan, melt butter over medium-high heat. Add onion, garlic, and cayenne and cook, stirring often, until softened and just starting to turn golden about 4 minutes. Add brandy and cook until completely evaporated. Add cauliflower, cream, and thyme. Drain pecans and add to saucepan. Bring to a simmer, then cook, adjusting heat to maintain a simmer, until cauliflower has softened and liquid has reduced to about 3/4 cup, about 10 minutes. Discard thyme sprig. Add soy sauce. Using a blender or immersion blender, blend cauliflower and liquid to form a very smooth purée. Season with salt and pepper. 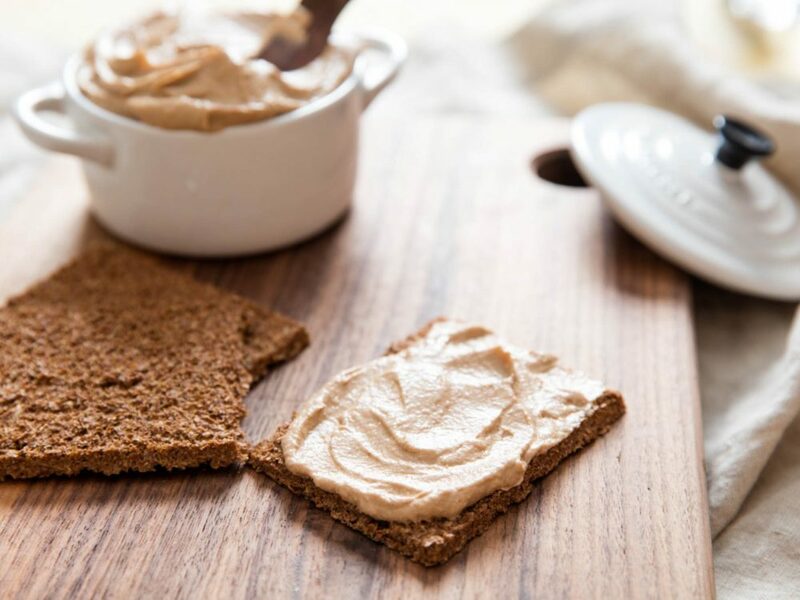 To chill rapidly, spread vegetarian pâté in a thin, even layer on a parchment-lined baking sheet (a quarter-sheet size is best for this), then press plastic wrap directly against pâté’s surface, pushing out any air. Otherwise, transfer pâté to a heatproof container and press plastic directly against surface. Refrigerate until well chilled. Transfer to a serving vessel and serve with crackers or toasted baguette rounds. Honestly, all of this looks good. I feel like I’d really enjoy snacking on these things daily. Thanks for sharing this! I love avocado toasts. They’re very filling and avocados are magic fruits to me! The crispy chickpeas seem like a good alternative to chips whenever I’m craving it. I think it would also be nice to add different spices depending on what you feel like eating that day. Thanks for the idea. I knew I should be planning ahead. My pantry would be very happy and colorful if I always had to prepare a snack that’s as good as this. But honestly, I feel like it would cost a lot to ahve a lifestyle like this. It only gets expensive if you don’t properly plan your grocery trips. The farmer’s market is also recommended if you really want to look for cheaper and fresher finds. Popcorn is my personal favorite. Even my kids love them and I always have room to play with flavors. I really want most of this especially the quesadillas. This isn’t even just for snacks, it can be a quick fix dinner. Finally something quick and everything actually looks good and the ingredients aren’t weird. I love your vegan snack recipes! I’ve been vegetarian for a year and vegan on and off for the past month, I will succeed!! ALL LOOKED SO DELICIOUS 😍 these are such awesome ideas! thanks for the inspiration! Glad you liked them, Leah! I can really vouch that they’re delicious! Your snacks sound really good! Next time I cook some chickpeas I really have to remember to set some aside for baking. 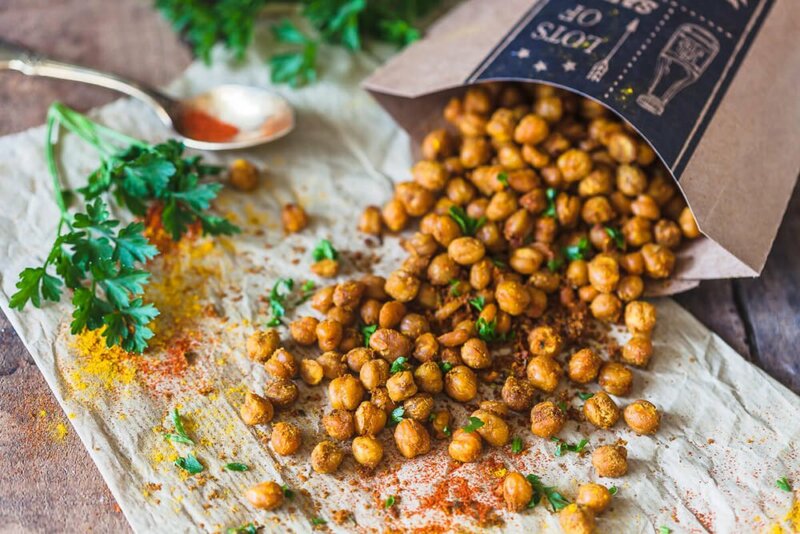 I love crispy chickpeas with different flavors! This food looks SO GOOd I love you so much, I’ve been kinda starving between meals since I went vegan because my dumbass can’t think of anything to eat other than bread but these look so delicious oh my god please make more vegan recipes your taste is so on point! What great ideas 😊 These all look soooo delicious, I definitely have to try them out!! now i have to wipe all this drool off my keyboard 😛 i’m just a beginning my journey to vegan, so these recipes are really helpful! thank you! Omg so creative!! Love your recipes! You are so creative when it comes to new recipes 🤗 I really want to try them all. big fan of your recipes! i’m vegan myself and have been struggling to find meals that are easy and fast and portable. these have been so intriguing and helpful and you seem so kind and nice! What advice do you have to make a smooth transition to vegan? Your recipes have motivated me to change my eating habits but I don’t know how to start! I suggest that you don’t immediately switch to full vegan at first. Let’s say substitute one to two ingredients to a vegan alternative that works for you (and your tastebuds). Keep in mind that food brands may give you different quality and tastes, so don’t get discouraged if you think the one that you tried doesn’t suit your taste. It’s also very helpful to talk to friends that are into the lifestyle and ask for recommendations. Take it slow and enjoy the lifestyle. Rushing it doesn’t get you anywhere and it might even discourage you in the long run. I love you so much! It’s because of you that I went vegan! Continue doing what you’re doing my friend! I thought about going vegan but realized I have no idea what food to make. Your recipes have helped me stay consistent with my vegan diet. Keep it up! Can you make these recipes the night before? Will it still be good the next day? These are amazing recipes. I am truly going to make that vegan pâté with cauliflower and pecans. I have a big taste for cauliflower. Love it! Thanks for the recipes. May I just mention you look sooooo good! Your face looks clean and vibrant. Healthiest looking vegan I’ve probably ever seen. I love that you don’t recommend a bunch of fake meat. You make it look easy. Beautiful! What a great help. I’ve been looking for something for on the go, specially for nature trails, hiking etc. They all look so delicious too will definitely try all of it. you’ve inspired me to start making a transition! I’m already incorporating tons of vegan meals into my life I’m just trying to make the full plunge! I find condiments difficult as I’m a sauce girl. Can you do a full article on sauces (creamy/runny/spicy/sour etc) that would be awesome! I want to go vegetarian or even vegan, but I’m very allergic to peanuts and chickpeas, and it seems like they are in mostly recipes 🙁 what can I do? I’m trying to become vegan and I’m looking for real meals to replace the smoothies and juices that are becoming boring and I found you!! Oh my God you are amazing!!! Okay so this has to be your best one yet! I want to try them all, especially that vegan pâté with cauliflower and pecans! I have been eating the exact same sandwich at the same time every day for 5 years for lunch. I think I might try your snacks for lunch from now on cause they all look really good. Thanks for the ideas. Always remember, Ricardo that variation is the key in order to enjoy and make the most out of the vegan lifestyle! 3 months vegan as of this weekend!! Your recipes and others in the community made me realize how easy and creative being vegan is! Thank you for everything! That’s amazing, Stewart! I’m always here to help! You are my inspiration and your recipes are fantastic 😍 keep posting and inspiring folks . Thank you. These are great. It would be really helpful if you could add weight loss/diet options along with your recipes . So far I’ve tried the popcorn recipe and it is amazing. My kiddos actually prefer this to the store bought since they get to be part of the process of making it. Thank you for all your recipes and inspiration! I’m vegetarian and want to be vegan… these recipes make it look so much easier and better , thank you! I love food. I mean, who doesn’t right? but my problem is, I can’t stop eating. Could you make low cal but still nutritious snacks and/or meals? Thanks for sharing these amazing recipes. Can you please share a few with low FODMAP? My son has IBS and I want to learn some healthy meal recipes. I’m not vegan but have been trying to replace most of my meals with vegetarian and vegan alternatives. I’m quite fussy with food and I have to say that chickpea looks delicious! I will be trying that out for sure! Love these ideas! Thank you so much. I am really having a hard time (mentally) with kicking the sugar habit. Truly enjoyed these snack choices. Thanks for sharing. These food Ideas are great for college students like myself. I think I should switch to these amazing ideas. Serial snacker here! I definitely stick to healthier foods throughout the day when my snacks are interesting (instead of just raw almonds lol). So many yummy ideas here, especially love the popcorn idea! Thanks…..Your ideas are always helpful and great. Though i live in a place which is actually a hillstation and not so developed so its difficult to find all these ingredients here. But personally i have been quite influenced by you and i have started giving up all unhealthy snacks and try to replace them with fresh fruits as snacks for my office. Do you have any tips for vegans with food allergies. I just recently developed an allergy to corn and it’s driving me crazy. Some of my favorite foods aren’t things I can eat anymore. I even have problems with some vegetables and fruits because companies keep them looking fresh with an eatable corn-based wax. I’m not getting enough nutrients and it’s really taking a toll on me. Thanks! They look absolutely delicious and sure healthy as well. Thank you for the recipes. Can’t wait to try them! These are things I would actually eat ❤️ I feel like so many vegan dishes have odd ingredients I don’t care for but these are easy alternatives to foods I normally eat . it’d be cool to know how many calories each snack has but regardless this was an amazing post definitely am going to try these recipes out. Im soo lazy when it comes to cooking. These are perfect for me! Very easy, fast healthy meal and snack ideas. Thank you . I love this it’s so helpful and the recipes look delicious 🤤🤤 Way to go! You are legendary! People have to be careful with raw chickpeas. I heard they are safe if they are sprouted or whatever??? (idk) but it’s easy to get sick from raw chickpeas so people have to be really careful if they want to eat them uncooked. Absolutely loved it!! Ever since I turned vegan, my life turned upside down because one I am a bad cook and two, I thought vegan diet cant taste good ever. After seeing this, I realised some rays of hope. Thank youuu!! Definitely going to try!! Went vegan about 3 weeks ago. I really appreciate your recipes because I’m still trying to figure out what to eat and never had any cooking background. Everything looks so delicious, i can’t wait to try these! Do you also have any recipes using a toaster oven? A huge thank you for this! I’m not a vegan (YET!!) but following your recipes helped me lose 30 pounds so far. This is such a great post, and I will totally be making some of these recipes! Thanks so much for sharing. This is such a life saver! Please make more easy ones that one could, for example, take to work! Keep up the good work! How about doing a recipes guide with like 4/6 recipes using the same ingredients throughout the recipes ? wow these were fantastic ideas actually i loved it thank you for these vegan life hacks!!! Great piece. Can’t wait to try all of these snacks. Looks delicious. Thank you so much for the recipes. Peace and Blessings. Amazing :- ) I really need to improve my snack game so this was inspiring. I would definitely love to see more “limited ingredients” recipes. I love this! I’m new to the whole vegan life and I’m moving back into my college dorm room so easy recipes are so helpful! Everything looks and sounds so good and simple! Thanks Rebecca. I’ll definitely​ try some out. Thank you! Always looking for super easy vegan snacks and recipes so I’m obsessed with these! I recently turned vegan (from vegetarian) and was struggling with how to get started as well as meal/snack ideas and prep – but thanks to you my transition has been so much smoother and I’ve eliminated anything animal related in my diet. That’s amazing, Eula! You did such a great job. Great ideas! Very helpful! Thank you! I wish you made Youtube vidoes, you’d get millions of hits! I love how these snacks can be easily be made ahead and taken on the go! Thank you! omg all of these look amazing!! I’m not even vegan but I still follow your blog and try some of your recipes. 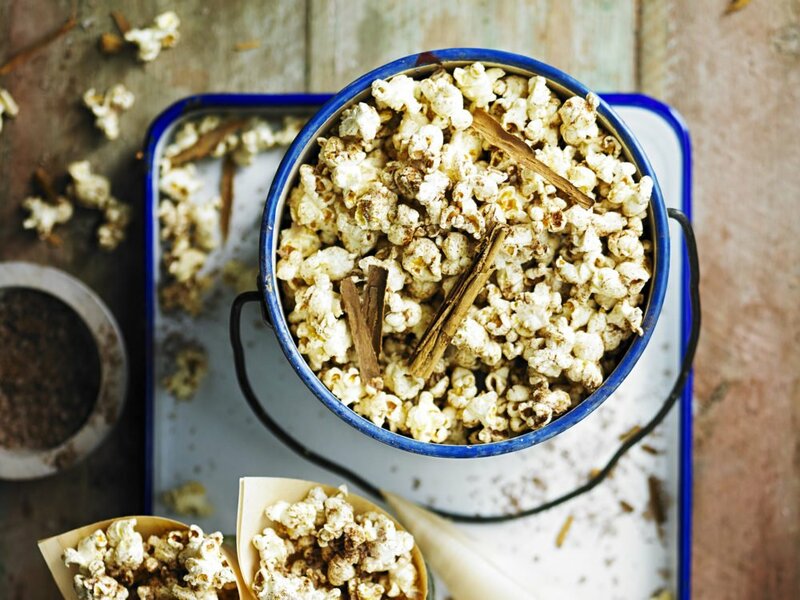 Spiced popcorn sounds so good! I make popcorn balls using Cookies ‘n’ Cream Popcorn Balls using white chocolate and cookie chunks instead of dark chocolate and peanuts! You should try! Wow you’re slowly turning us all into vegans!!!! 😂 I’m definitely going to make the avocado🥑 one! Tried the crispy chickpeas…. And… Omg literally the best thing ever!!!! Mine were a lil toasty because I forgot about them but they were soooooo delicious! 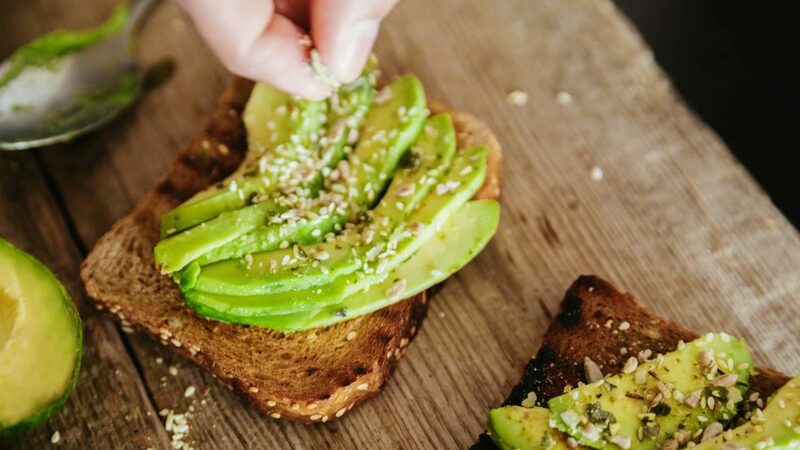 Avocado toasts are the best. If you’re not vegan, you can always add goat cheese and it tastes wonderful. Really? I haven’t really tried. Sounds good though! I promise you, it’s going to be worth it. I enjoy healthy food a lot because I take the time to prepare it. It’s a very fulfilling feeling. Radiant Peach actually has an article about making food preparation easy. It has inspired me to really take a few hours a day and prepare my own food. All of this looks delicious. Great timing because I’m currently listing down what I need to buy at the supermarket for my weekly meals. I was supposed to do it last monday but I was too busy.